Download "How to Start a Dojo. Introduction and Principles"
1 Introduction and Principles How to Start a Dojo Setting up a CoderDojo is an exciting and straightforward process. If you run into something you can not figure out then If it looks like inspiring chaos you probably got it right. The CoderDojo format is the result of intensive design, development and a lot of real world testing completed by the founders in the original Dojo in Cork, Ireland and refined by volunteers who created their own Dojos in communities and businesses. CoderDojo is an open source learning environment that really delivers. CoderDojos are free! Really FREE, free of charge, and there is no central organisation that wants to charge you. It is full of fun and freedom for young people. If you need anything for your CoderDojo go out and ask your local community; it s leaders in business and government. CoderDojos are a no brainer when it comes to getting support from nearly any high tech business and every Dojo location so far has been donated or locally sponsored. The One Rule Be Cool! 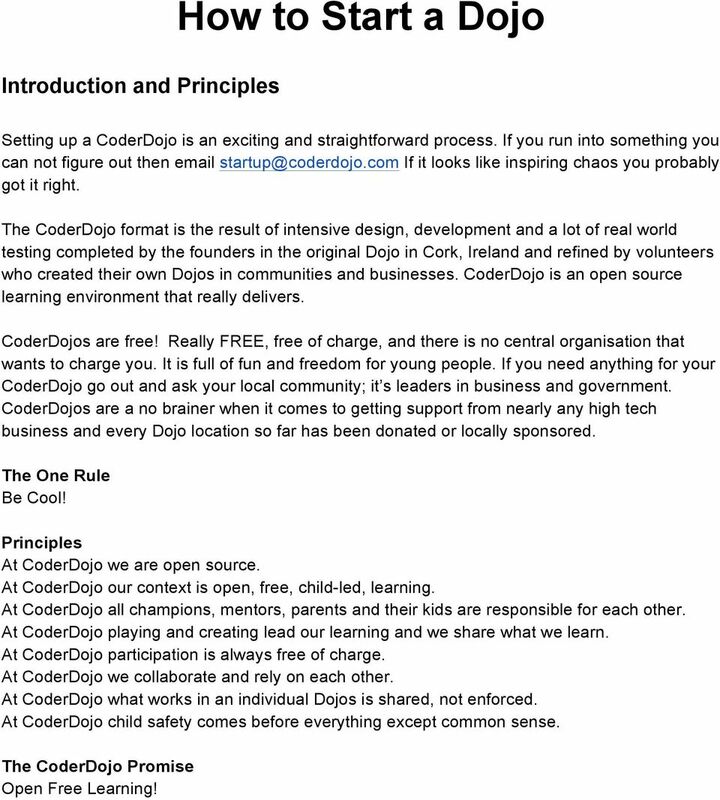 Principles At CoderDojo we are open source. At CoderDojo our context is open, free, child-led, learning. At CoderDojo all champions, mentors, parents and their kids are responsible for each other. At CoderDojo playing and creating lead our learning and we share what we learn. At CoderDojo participation is always free of charge. At CoderDojo we collaborate and rely on each other. At CoderDojo what works in an individual Dojos is shared, not enforced. At CoderDojo child safety comes before everything except common sense. The CoderDojo Promise Open Free Learning! 2 You Will Need Space with Internet for 2-3 hrs per week (preferably with WiFi) Description - The space you ideally want would be relatively open plan, where you can drag and move around tables and chairs to keep an informal environment, stay away from a very linear classroom like layout. Local tech businesses, incubators, schools/colleges are all great, cafeterias work particularly well. Schedule CoderDojo s work well when run on an open and regular basis. Many Dojos run every Saturday, but this can vary based on the resources you have at hand. It preferably needs to be available for 1-3 hrs once a week. Insurance - every professionally run building will have a standard public liability insurance policy which usually covers an informal gathering of the public. The quickest way to describe CoderDojo to an Insurance provider is "a weekly gathering of approximately x number of children with their parents for a few hours; for the purpose of learning about computers. The session is self organised with different children and adults explaining subjects to each other in a club atmosphere." Equipment & Supplies - CoderDojo requires no equipment to get started except laptops that individual families can bring themselves. A digital projector is extremely useful. Check for heat, light and lots of power sockets. More information on setting up a wifi network is available on our running a Dojo page. Paying the Bills - different Dojos have found different ways of staying free: commonly the building/business owner donates the space because their kids are learning code, sometimes a corporate or business sponsor have paid the bills, and sometimes mums and dads chip in to cover the cost via a local community group. You can try one of these options or come up with your own just as long as CoderDojo stays free for participants. Also see the note about money below. 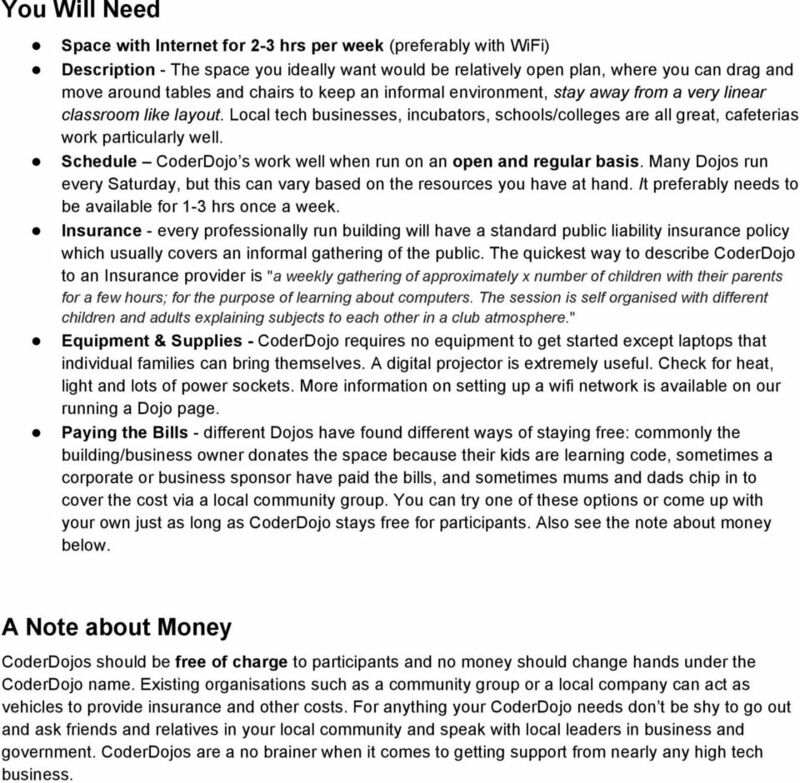 A Note about Money CoderDojos should be free of charge to participants and no money should change hands under the CoderDojo name. Existing organisations such as a community group or a local company can act as vehicles to provide insurance and other costs. For anything your CoderDojo needs don t be shy to go out and ask friends and relatives in your local community and speak with local leaders in business and government. CoderDojos are a no brainer when it comes to getting support from nearly any high tech business. 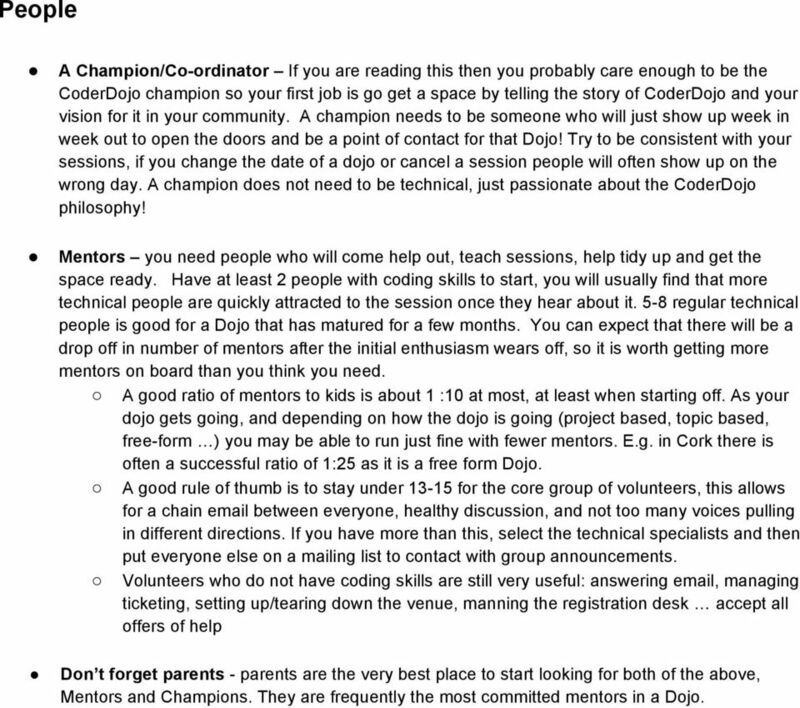 3 People A Champion/Co-ordinator If you are reading this then you probably care enough to be the CoderDojo champion so your first job is go get a space by telling the story of CoderDojo and your vision for it in your community. A champion needs to be someone who will just show up week in week out to open the doors and be a point of contact for that Dojo! Try to be consistent with your sessions, if you change the date of a dojo or cancel a session people will often show up on the wrong day. A champion does not need to be technical, just passionate about the CoderDojo philosophy! Mentors you need people who will come help out, teach sessions, help tidy up and get the space ready. Have at least 2 people with coding skills to start, you will usually find that more technical people are quickly attracted to the session once they hear about it. 5-8 regular technical people is good for a Dojo that has matured for a few months. You can expect that there will be a drop off in number of mentors after the initial enthusiasm wears off, so it is worth getting more mentors on board than you think you need. A good ratio of mentors to kids is about 1 :10 at most, at least when starting off. As your dojo gets going, and depending on how the dojo is going (project based, topic based, free-form ) you may be able to run just fine with fewer mentors. E.g. in Cork there is often a successful ratio of 1:25 as it is a free form Dojo. A good rule of thumb is to stay under for the core group of volunteers, this allows for a chain between everyone, healthy discussion, and not too many voices pulling in different directions. If you have more than this, select the technical specialists and then put everyone else on a mailing list to contact with group announcements. Volunteers who do not have coding skills are still very useful: answering , managing ticketing, setting up/tearing down the venue, manning the registration desk accept all offers of help Don t forget parents - parents are the very best place to start looking for both of the above, Mentors and Champions. They are frequently the most committed mentors in a Dojo. 4 Planning If you can, check out a nearby Dojo, mentor there for a while to see how it works. Get mentors from that dojo involved in giving you advice. Get someone from there to help with the first session. It may be a better experience for all to help by improving an existing dojo rather than starting a new one near to it. The risk of starting dojos too close together is that there will not be enough mentors for both. If you have better premises, move the dojo to that location. 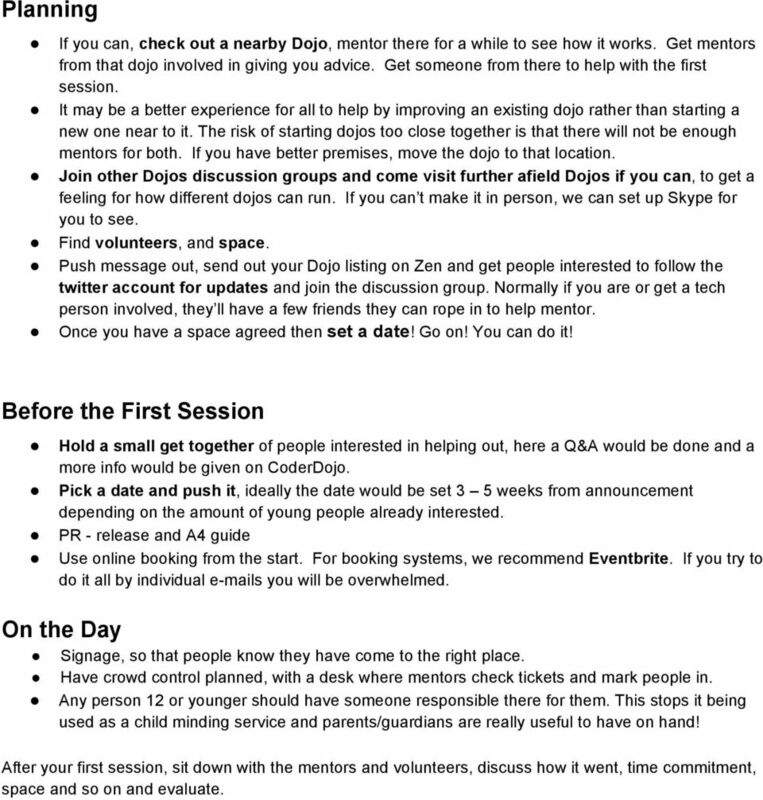 Join other Dojos discussion groups and come visit further afield Dojos if you can, to get a feeling for how different dojos can run. If you can t make it in person, we can set up Skype for you to see. Find volunteers, and space. Push message out, send out your Dojo listing on Zen and get people interested to follow the twitter account for updates and join the discussion group. Normally if you are or get a tech person involved, they ll have a few friends they can rope in to help mentor. Once you have a space agreed then set a date! Go on! You can do it! Before the First Session Hold a small get together of people interested in helping out, here a Q&A would be done and a more info would be given on CoderDojo. Pick a date and push it, ideally the date would be set 3 5 weeks from announcement depending on the amount of young people already interested. PR - release and A4 guide Use online booking from the start. For booking systems, we recommend Eventbrite. If you try to do it all by individual s you will be overwhelmed. On the Day Signage, so that people know they have come to the right place. Have crowd control planned, with a desk where mentors check tickets and mark people in. Any person 12 or younger should have someone responsible there for them. This stops it being used as a child minding service and parents/guardians are really useful to have on hand! After your first session, sit down with the mentors and volunteers, discuss how it went, time commitment, space and so on and evaluate. 5 Legalities and Child/Mentor Protection The foremost principle to remember with all bureaucracy and red tape is common sense. The information provided on this page and elsewhere on the CoderDojo is a guide on how a CoderDojo can be created, however each dojo is operated independently, and they are not directly connected or affiliated in any way. We do not endorse any Dojo or Individual taking on risk. Laws may vary between jurisdictions, and it may be appropriate to seek legal counsel. 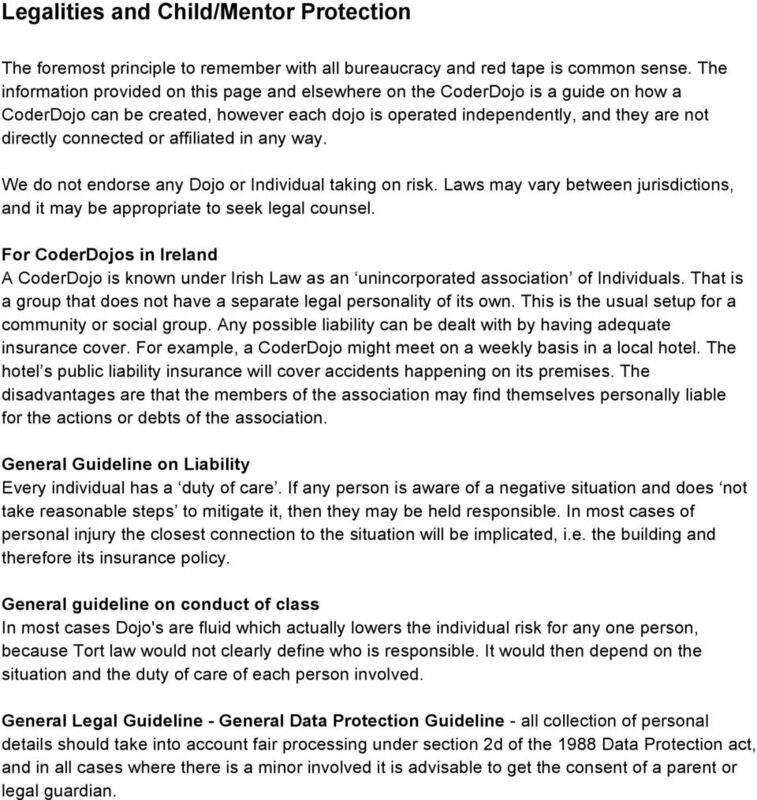 For CoderDojos in Ireland A CoderDojo is known under Irish Law as an unincorporated association of Individuals. That is a group that does not have a separate legal personality of its own. This is the usual setup for a community or social group. Any possible liability can be dealt with by having adequate insurance cover. For example, a CoderDojo might meet on a weekly basis in a local hotel. The hotel s public liability insurance will cover accidents happening on its premises. The disadvantages are that the members of the association may find themselves personally liable for the actions or debts of the association. General Guideline on Liability Every individual has a duty of care. If any person is aware of a negative situation and does not take reasonable steps to mitigate it, then they may be held responsible. In most cases of personal injury the closest connection to the situation will be implicated, i.e. the building and therefore its insurance policy. General guideline on conduct of class In most cases Dojo's are fluid which actually lowers the individual risk for any one person, because Tort law would not clearly define who is responsible. It would then depend on the situation and the duty of care of each person involved. General Legal Guideline - General Data Protection Guideline - all collection of personal details should take into account fair processing under section 2d of the 1988 Data Protection act, and in all cases where there is a minor involved it is advisable to get the consent of a parent or legal guardian. Multi City Event Challenge FAQ! 56 Key Profit Building Lessons I Learned from Jay Abraham s MasterMind Marketing Training. James Marchant Founder of Diligence Digital james@diligencedigital.co.uk 01424 447858 Over 15 years of experience in the digital industry. Hello and congratulations on taking the time out to read our booklet. Your guide to community fundraising www.thera.co.uk/donate Our vision We will show that people with a learning disability can be leaders in society. We will be controlled by people with a learning disability. Adolescent drug abuse and the impact of the family dynamic. This is Stay Happily Married: Episode #279. 10 Questions To Ask When Choosing a Franchise You want to do something for yourself but with business support, and have decided that a franchise is the right option for you. But where do you start to look? Welcome... T. hank You for supporting Cornwall Air Ambulance Trust. Please keep this useful booklet safe. Your guide. to prepayment meters. Helping our customers. We re on it. UX Show and Tell. e r o v a. Organizing, marketing, and facilitating workshops to share user experience design documentation and deliverables. That was such an amazing weekend! 3 days of pitching, working, talking, planning, designing, creating but let s start from the beginning. 7 steps to choosing the right IT support company.